Because of the modern plumbing system that you have in your home, you’re able to go about your day and carry out a variety of tasks thanks to the performance of your pipes and drains. One of the main components of that plumbing system is your sewer line. All of the drains in your home feed into this one pipe that connects your home to your sewer utility at the street. If you start to have problems with your sewer line, like clogs, cracks, tree roots and other obstructions, it can cause serious problems with your entire plumbing system. Because your sewer line is buried deep under your home, it can make performing any repairs on it very difficult. But thanks to trenchless sewer line repair, it’s a whole lot easier. Resolve Trenchless offers trenchless sewer line repair in Warminster, which could save you time, money, and the hassle of having your plumber dig up your entire yard to get to your faulty sewer line. Give us a call today if you’re having any sewer line problems and we can perform a full diagnostic to determine exactly what’s causing the problem and where it is. Before trenchless technology was available, sewer line repair was very difficult, time consuming, and costly. Plumbers would have to excavate homeowners’ entire yards to access sewer lines and perform repairs. But now, with trenchless sewer line repair service, the job only requires a couple holes to be dug and can usually be completed in a day. There are a couple different methods and we’ll explain both of them in more detail below. With pipe bursting, our plumbers dig two holes at either end of your sewer line. Then, we use powerful pumps to literally pull the new pipe through the old pipe. A metal cone at the front of the new pipe splits the old pipe and bursts it leaving you with a brand new pipe in its place. As its name suggests, pipe relining leaves the old sewer line intact and relines it with a very strong new pipe. With this method, we can often dig just one hole in your yard to gain access to one end of your sewer line. The benefits of calling Resolve Trenchless for trenchless sewer line repair are many. Not only does it take less time to complete the job, but there is far less clean–up. Imagine having a large trench dug through your yard, probably many feet deep, while plumbers worked to repair your sewer line. It would take a long time to get everything cleaned up, and your yard put back together—not to mention the time it takes for your grass or vegetation to recover. With trenchless sewer line repair, all the clean–up that’s involved is our plumbers having to fill in the small hole that they dug. If your sewer line breaks, sewage can seep out onto your yard. If you notice that your yard has unexplained puddles or damp spots and a sewage smell, you probably have a sewer line problem. At the first sign of any of these issues you should call a professional sewer line replacement expert. The problem will only grow worse over time, so repairing or replacing your pipe should be a priority. There are a few reasons why your sewer line might break. 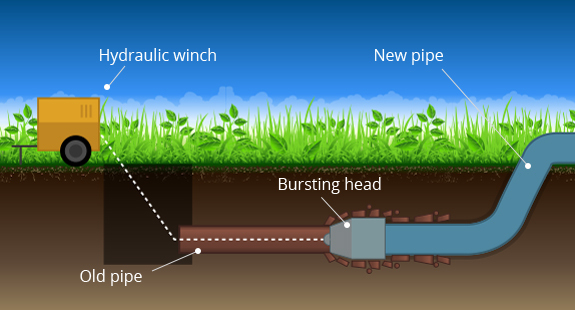 The most common is tree roots infiltrating the pipes. As trees grow, their roots system expands throughout your yard. If the roots are near your sewer line, they will wrap around it and try to enter it through weak spots in the line. If roots get into your sewer line they can cause leaks and blockages. Another possible cause of a broken sewer line is improper installation. If the line was not installed correctly, the pipe might leak or break at the joints. The best way to prevent this problem is by choosing a reputable contractor like Resolve Rooter for your initial installation. The cause of your sewer line problem can be examined use video pipe inspection. One of our Warminster sewer line repair specialists will be able to feed a fiber optic video cable through your sewer line to determine the cause of the leak or blockage as well as the extent of the damage.